The seat on your Western saddle is more than just a place to put your rear end while you are riding. Western saddle seats can be made out of an assortment of materials, but the most common fabrics used for the seat are leather and suede. 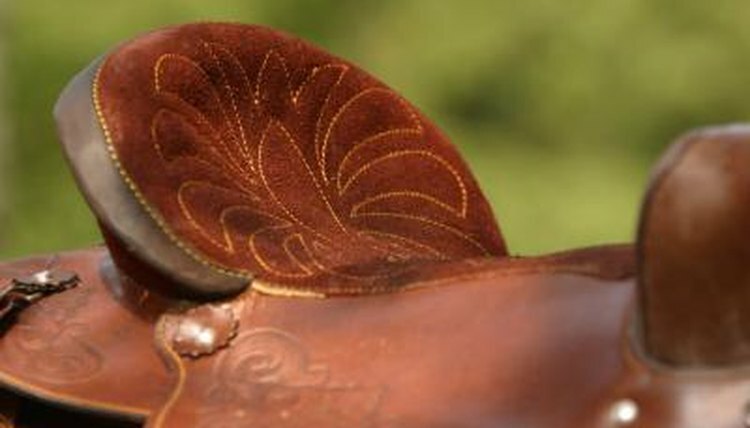 Suede saddle seats have both benefits and drawbacks. The primary benefit of a suede saddle seat is that the suede helps you stay stuck to the saddle. Leather saddle seats are slick and smooth while suede has a rough texture that helps keep your rear end from slipping out of the saddle. Suede is very popular for saddles used in speed events such as barrel racing and pole bending. The added traction provided by the suede seat can help the rider maintain better position and control while riding. When a suede seat is combined with a pair of riding chaps, the rider will have very little slip or bounce in his seat. The suede can also help the rider sit the trot and the canter more effectively and smoothly. Suede is difficult to clean and easily stained. Light-colored suede can quickly become discolored if it gets wet or sweaty, or if cleaning oils come into contact with the suede. Discolored suede can be unattractive, it can cause the saddle to lose value if you decide to sell it. To avoid discoloration, brush suede seats with a dry cloth or brush rather than oil them. Suede wears down over time and will lose a number of its beneficial properties as you ride in it repeatedly. Suede seats can wear smooth, becoming slick and uncomfortable to ride in. Suede seats are nearly impossible to fix when they become worn down; the only way to correct the wear is to place a seat cover over the suede.